A blog that contains articles on Spiritual topics. The content is grouped into various categories such as Mahabharata, Saints, Srila Prabhupada, etc. 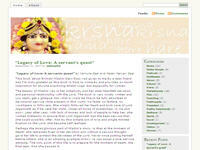 Category Blogs June 30, 2012 by ISKCON Desire Tree.